Important Note: NeoOffice 3.3 is now Donationware and requires a donation of at least $10 within the last year to be downloaded. However, version 3.2.1 which supports up to Lion OS X 10.7 is still free to use. NeoOffice is a welcome open source alternative to the pricier Microsoft Office and iWork'08 office suites. The application carries with it all the applications that you'd expect: word processing, spreadsheet, presentations, database and drawing. You'll find the interface of NeoOffice and the range of tools in the office suite very similar to what you'd find in Microsoft Office. However, NeoOffice does load up much faster when opening up any document. Most tools open up in a new window so make sure you don't have too many open, otherwise the interface will look really cluttered. All the different applications in the NeoOffice suite work well and are more than worthy replacements to the options available in Microsoft Office and iWork'08. The presentation tool is the only one I was disappointed with, as it doesn't offer as many templates or tools as I expected to create a shiny, professional presentation. You'll find very thorough help docs and excellent wizards to master all elements of NeoOffice. 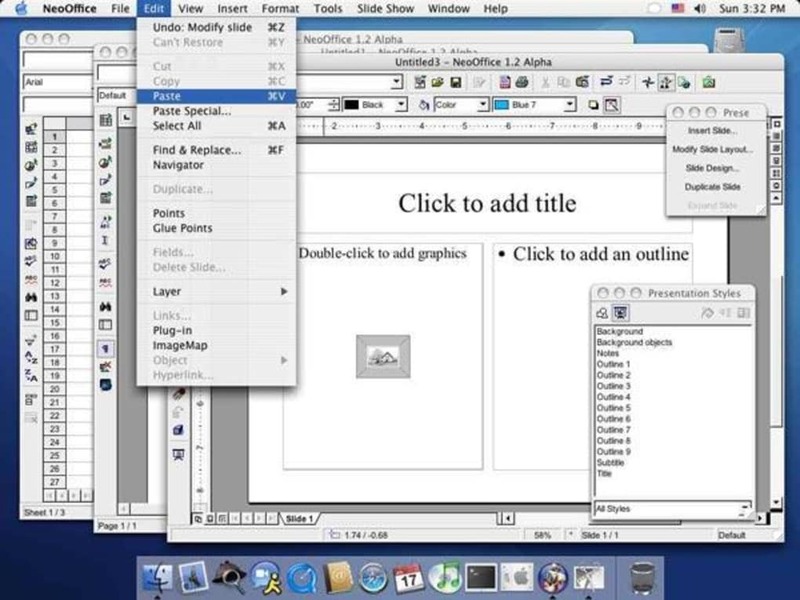 NeoOffice has been most recently updated to be Mountain Lion compatible with Retina Macs. Please note that although NeoOffice used to be free, since NeoOffice 3.2 and above, it requires a donation of at least $10 a year before you can download it. Although the presentation tool is a little weak, the rest of the applications in NeoOffice make for a very good free office suite. not a program. this is just a patch not the base installer. also the version is incorrect, it should "NeoOffice-3.0.2-Patch-4-Intel" not 3.2.1.